I think the “some people” are us, so let’s examine what the analysis of “some people” (us again) says on this topic. Compare this metric to Win Score, the simple measure we introduce in The Wages of Wins. If we look at these two measures, what differences do we observe? Relative to points scored – the factor that dominates player evaluation in the NBA – both measures value rebounds, steals, and turnovers the same. Let me repeat, the NBA Efficiency measure – again which Kaufman quotes approvingly in his column – values points, rebounds, steals, and turnovers the same. So what’s the difference? One can note that Win Score has different values for assists and blocked shots. One can also note that we incorporate personal fouls. But these are not the truly important difference. The important difference is how we value shooting efficiency. As we observe in Chapter Seven of our book, the NBA Efficiency metric fails to emphasize the importance of shooting efficiency. One can read the relevant excerpt HERE. For a slightly shorter version of the story, consider a player who takes three shots from two point range and makes one. According to NBA Efficiency this player has broken even – adding two from the made basket and losing two from the missed shots. So with a shooting percentage of 33% this player breaks even. If he shoots better than this meager threshold – and no NBA player who played at least 500 minutes last year failed to at least equal this minimum – the more he shoots the higher his value in NBA Efficiency. From three point range the break even point is only 25%. Again, if you shoot better than this rate from three point range, the more you shoot the better your value according to NBA Efficiency. The proper valuation of shooting efficiency is THE key difference between the NBA’s metric and our measure. As we note in our book, even if you are not a very efficient shooter – like Antoine Walker or Allen Iverson – you will still rank fairly high in NBA Efficiency. All a player needs to do to secure a high ranking is take an above average number of shots. One should note that these players are still paid very well, further evidence that shooting efficiency is also not properly noted in the salary determination process in the Association. Kaufman notes that “It’s part of every basketball player’s job to score, pass, rebound and play defense.” Yet the metric he praises is dominated by only one aspect of performance, scoring. Let’s go back to Kaufman’s comment on rebounds. To illustrate how rebounds are not the factor that dominates Win Score, I created a Kaufman-inspired adjusted formula. Specifically, I kept everything the same but I lowered the impact of a rebound to only 70% the value of a point. 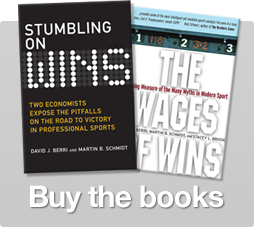 The correlation between Win Score and the Kaufman inspired formula is 0.99 for players in the 05-06 season. In other words, changing the value of rebounds does not change your results. Clearly, the issue is not rebounds. Oh, and no I am never using the Kaufman-inspired formula in any analysis. I just created this to make a point. Two more points…the same criticism of NBA Efficiency also applies to John Hollinger’s Player Efficiency Ratings (PER). This is a point I will elaborate on in the future. For now it is interesting that two metrics that note efficiency in their titles do such a poor job of evaluating inefficient scorers. And, as I noted many times before, it is important to note that Win Score is the simplified version of Wins Produced. It does not take into account the tempo a team plays or the quality of its defense. And it doesn’t adjust for position played. All of these issues are noted in the calculation of Wins Produced. As I mentioned above, the inability to recognize the relative value of rebounding was not the only problem with Kaufman’s analysis. Next week I will discuss how his analysis reported in his column fails to accurately measure the link between rebounds and wins. 37 Responses to "Do We Overvalue Rebounds?" How well does Win Score predict team wins without a position adjustment, and is this better or worse than NBA efficiency? I’ve been told it does worse than NBA efficiency but I haven’t seen the research to back it up. Of course this ignores the elephant in the room, that basketball is not five games of one on one (the team is not simply the sum of the individuals) and any individual rating system that treats it as such that ignores teammate interaction, but I’m sure you’ll come to grips with that at some point. Obviously a method that weights the factors in terms of wins will predict better than a method that does not do this. So people who argue that NBA Efficiency predicts better than Wins Produced or Win Score a simply mis-informed. I will note that there is a fair amount of mis-information out there about our methods. For example, at one point I saw someone regress his measure of performance on all the other measures of performance. Frankly that is just a silly approach and shows that knowing how to run a regression is not quite the same as knowing why we run regressions. About teammate interaction — I assume you are trumpeting the plus-minus approach. We talk about the problems of that approach in the book. I think I will post on that subject in the next few weeks. Win Score is valuing rebounds more than NBA Efficiency, relative to scoring. Let’s compare the net value of a rebound with that of each of the three scoring events, a made two-point field goal, a made three-point field goal, and a made free throw, in the two systems. Your formula breaks each of these events into two statistics, points and attempts (and you have to subtract the two to get the value that I provided), but how we label the value of scoring events is irrelevant. In Win Score, getting a rebound is worth twice as much as scoring a point on a two-point field goal or a free throw, and 1.5 times as much as scoring a point on a three pointer. Since somwhere around a fifth of points come on threes, that means that a rebound is effectively worth about 1.9 points, which is 1.9 times as much as it’s worth in NBA Efficiency. So you do value rebounding more than NBA Efficiency, relative to scoring. This could be thought of as a consequence of the way in which you account for shooting efficiency, which depresses the value of scoring, although the relative value of scoring and rebounding can be adjusted independently of the standards for shooting efficiency (as you did in your Kaufman-inspired model). And none of this says anything about whether you are overvaluing rebounding. There are some problems with Kaufman’s analysis, but he makes one crucial point: when a player gets a rebound, a lot of the time that rebound would have gone to a teammate if he hadn’t gotten it. That means that, even though every defensive rebound for the Chicago Bulls is worth a possession for the team, the average defensive rebound by Dennis Rodman could only be worth a tenth of a possession for the Bulls, if 90% of the time another Bull would have brought down the rebound had Rodman not been on the floor. That implies that Win Score (and Wins Produced) could be greatly overvaluing players who get a lot of defensive rebounds (even if it’s correctly valuing teams that get a lot of rebounds). I’ve seen other people make this same point on multiple occasions, but if you’ve ever responded to it then I’ve missed it. Do you have a response that you could link to, or that you could write? then rebounds as a possesion (0.9 to 1.2 points) are not overvalued than points, eventhough I think, to defend and avoid the opponent scoring, even without blocking or stealing, have more value than gain a possession that could be wasted and that is maybe a result of a previous defensive action or just luck. The link between rebounds and wins must be more a product of the team or individual defense, or of the scorers which use or misuse the possession, than rebounds per se. I´ve seen a lot of boxscores where the team with more rebounds loose badly, while almost that never happens with the best efficient scorer. Sometimes when you rebound (DR), you are just assuring a possession gained previously, then defensive rebounds must be taken with a grain of salt. We have to be very careful in distinguishing between over-valuing a statistic and improperly crediting a statistic to an individual. As best I can tell (though I still need to see a document spelling out methods for computing wins produced to really convince myself). A rebound is always a rebound. A defensive rebound always means that the opposition failed to convert on a shot and thus had a wasted possession. An offensive rebound always means that a missed shot did not yet cost a possession. There is no way that any *particular* player getting credit for this changes what the rebound means in terms of the actual progression of the game as it relates to a successful or unsuccessful possession. This leaves two issues: how much do we value a possession, something that is independent of who on a team gets the individual credit and who on the team gets credit for obtaining (or extending) a possession, something that’s independent of the *value* of the stat. It seems to me that the critics of WP confound these two issues when criticizing the value of a rebound. The notion that another teammate *may* have received the rebound is at this point conjecture. While a rebound that otherwise would have been pulled down by a teammate can ‘incorrectly’ credit a player with individual stats, it doesn’t change the *value* of that rebound as it relates to the probability of winning. A Rodman rebound is always worth a possession for the Bulls, though *perhaps* Rodman was credited with too large a share of that rebound. It seems to me there are a few ways to address this. One is to look at the effect of a player on the team stats (yes, a +/- approach) though this has more than a few problems when controlling for a number of variables, including the quality of replacements and teammates with whom a replacement may be on the court with. Another is to look at how statistics are apportioned on a team vs. between teams to see if the unbalanced distribution somehow correlates with greater error when using WP or other methods to predict a team’s record. Jason has a very good comment above. But let me respond specifically to the question you raise about rebounds. We did discuss the issue you raise in The Wages of Wins. In Chapter Seven (pp. 115-117) we have a section on the Law of Diminishing Returns. In this discussion we note that the more productivite a player’s teammates, the less productive a player will be. We discuss this in terms of economic theory and we examine the empirical evidence. So yes, Rodman most definitely lowers the productivity of his teammates. But this effect is not limited to rebounds, a fact glossed over by the critics of Win Score and Wins Produced. Every time Michael Jordan took a shot, someone else on his team did not get to take the shot. So should we lower the value of shooting to take into account this effect? What we propose is that we credit the the value of the statistics to the player who is credited with the statistic. And the statistics should be valued in terms of their impact on wins. It is important to remember that the single best predictor of what a player will do in the future is what he did in the past. Yes, diminishing returns matter. Yes, teammates can impact the performance of a player. And yes, coaching can (although not always) increase productivity. Despite the impact of diminishing returns, teammates, and coaches – and unlike baseball and football players – basketball players tend to be fairly consistent across time. This suggests that the interaction effects have been exaggerated. If I understand your comment you are saying that Win Score better predicts Wins than NBA efficiency. I certainly believe you, but I would be interested to see what the R^2 for each is. The buzz in the community is that most of the predictive ability of your metrics comes from the position adjustment and the team adjustment. Obviously Win Score includes neither of these, but is still in principle similar to Wins Produced so it is a good test of how much better your linear weights system is than NBA efficiency because your does value rebounding more in relation to scoring(scoring includes shooting efficiency) and it is disingenious to argue that it doesn’t because you know it does. I do favor adjusted plus-minus to any linear weights system. You did not address this in the book, as adjusted plus-minus is very different from what Roland has on his site, if you need an explanation of it Dan Rosenbaum posted one on 82games.com a few years back, it kind of technical which I assume is why you didn’t mention it in the book, but I figure with some effort you can get through it. I think dberri is closing in on the the key way to think about shooting efficiency. Blar is right that rebounds not grabbed by one player — especially defensive rebounds — might well have gone to teammates. But it’s much more certain that, all things being equal, shot attempts not taken WOULD have gone to teammates. And that’s why shooting efficiency makes so much difference. Kobe scores 26 on 13 of 28 shooting. Elton Brand scores 24 on 12 of 24 shooting. Note here that the shooting percentages are quite close, and Kobe in the example is only a make away from shooting the same % as Elton. So who is more valuable (leaving aside all the other stats)? Brand, because of the slightly more efficient scoring. Because when he takes 24 shots, there are 4 other shots for other Clippers. They’ll make ~2 of them, for another 4 points. So Brand’s efficiency as a shooter makes him “worth” 28 points a night when compared with Kobe. Anyway, that’s the way I think about it. If I’m off the mark, let me know. I was a history and econ major, so my stats chops are purely recreational league. I can understand you can´t apply diminishing return to rebounds, cause you should then apply this to every player stat, but linear formulas critizicers say that scoring is penalized with failed shots (scorer is always responsible, defended or not, of the wasted posesion). When an opponent grabs an ofensive rebound, who is responsible to loose that ball? we must credit that lost possession to someone. Thanks for the responses, Jason & Dave. Jason, I think that we’re making the same distinction with different terminology. First, there is the value to the team of the team getting a rebound. Second, when we’re rating players (e.g. in order to decide if one player is better than another, or what salaries players should get, or who should get playing time) there is the impact that a player’s rebounding statistics have on his rating. WP critics are claiming that there is a problem with how WP treats defensive rebounds for the latter purpose, and you recognize that they might be right. You just think that this potential problem with WP shouldn’t be called “overvaluing rebounds.” I’d rather not get too deep into that terminological dispute. Here’s another way to think about the problem with how WP treats rebounds. Why do possessions have value, if winning only depends on points for and against? A possession has value because there is some probability that the team will turn it into points. Creating a possession gives your team an opportunity to score, and ending your team’s possession takes away the opportunity to score. Based on scoring averages, the Wages of Wins method calculates the expected value of a possession as about 1 point. So when Jordan makes a jumper, he gets 2 points added to his Win Score for scoring, but 1 point subtracted for ending the Bulls’ possession. Now, let’s look at defensive rebounds. A defensive rebound is like a steal, since both give possession to the rebounder’s team, but there’s an important difference. A steal turns a situation where the other team has possession into one where your team has possession, but a rebound turns a situation where there is a loose ball into one where your team has possession. But there is value to there being a loose ball, since there is some probability that your team will get possession of it. Just as a possession is an opportunity to score points, a loose ball is an opportunity to get a possession. Based on rebounding percentages, the expected value of a loose ball following an opponent’s missed field goal looks to be around 0.7 possessions. So when Rodman grabs a defensive board, why doesn’t he get .7 points subtracted from his Win Score for ending the loose ball, in addition to getting 1 point added for gaining possession? This way of framing the issue makes the point in terms of opportunity costs, rather than diminishing returns. WP already is taking into account the opportunity cost of shooting (you generally describe this aspect of the formula as crediting shooting efficiency), but it does not seem to be taking into account the opportunity cost of rebounding. The problem with that reasoning is that there’s not just a 70% chance of grabbing a loose ball just because. That figure is a product of the contributions and efforts of the players on the court. This effort is recorded statistically as a rebound that, if someone didn’t go get, wouldn’t magically go to their team 70% (or any percent) of the time. This is a figure that can change that is a result of the actual situations, not some apriori rule. There is no “opportunity” in a missed shot *other* than the opportunity to grab a defensive board. If your team doesn’t get it, your team has lost out. It is the only opportunity at the time and the result is binary–rebound or fail. There was no opportunity lost by his team by acheiving the only positive thing that can happen in the situation, though the opportunity for a teammate to be credited with the achievement changes. Again, this does not relate to the value of a rebound but only to whom is creditted with that value. Jason, you are sort of correct, but the rebounding situation is analogous to scoring. You don’t get one point per possession just because, this “figure is a product of the contributions and efforts of the players on the court.” To treat scoring one way and rebounding another is what causes a problem here. Either you acknowledge the lost opportunity in both cases, or in neither, doing it in only the case of shooting is what causes the overvaluation of rebounding in Berri’s system. 1- To apply a linear formula to measure player performance in an almost non-linear sport (Baseball is a high linear sport with few teammates influence, lineup order is maybe the most you will see there). 2- The use of the boxscore stats, an assignment of individual credits which overlook shared accomplishments, the most of them on defense. But being the actual NBA almost a five one vs. one game, boxscore ratings are not so far from reality. 3- The “possession” view of the game, an almost bizarre way to convert non-scoring boxscore stats into scoring, overlooking not boxscored defense. That´s why team/position adjusts and win regressions are used to try to fix the weights and shrink error margins for predictions, comparissons and references. +/- is another kind of team adjust. But in this ratings war, nobody wants to say the other uses the best trick. Actually, that’s *not* the way they’re treating rebounds. The value of a rebound in WP is determined by a regression where net effect of a a rebound as it relates to the overall probability of a win can be determined. As it is, the *reason* that there’s any relationship at all is because there’s a relationship between the efficiency of using possessions and wins and the reason that this figure has any sort of predictive value for esitmating records is because there’s a reasonably regular relationship between possessions and score and anything one can do to push the opponent below this raises the probability of victory. We can see *why* the rebound shows up as a positive in that a defensive board is evidence of an instance where an opponent was denied a chance to capitalize on their previous possession, just as a point is evidence that someone capitalized on the possession. It means that something has happened that lowered the other team’s efficiency, if only temporarily, but nonetheless, after a defensive rebound, the opposition, the team that lost possession, has clearly seen their efficiency for that contest drop since they’ve increased the denominator of possessions without increasing the numerator of points. There is a *lost opportunity* in failing to score and a more marginal lost opportunity in getting a single point out of a possession a and an even more marginal lost opportunity when a possession ends in in 2 points rather than three. You need a possession to score. Scoring one means that the opportunity to score two was not completely capitalized on. In that sense, an opportunity to score was or was not used. But that’s not the same case with a defensive rebound. Getting a defensive rebound is a lost opportunity only for the other team. It is not analogous because there isn’t another positive that can come out of it. The result is purely binary and the only way to realize an advantage in terms of relative efficiency is to grab that board and have a possession following a failed possession of an opponent. Now the actual *value* of the rebound may or may not be what Dave and company have deduced for one reason or another, but that reason isn’t because there’s a lost opportunity to do anything else. I’m sorry Jason, but either you are not understanding or you are intentionally being obtuse. Lets compare the cases: On offense you have a possession. The expected value of this possession is 1. When you score the actual value added when compared to average is only difference between what you scored and 1. In the case of rebounding there is a loose ball. Your probability of getting this loose ball is around 70%, which iss worth .7 points. If you get the rebound that is worth one point and therefore the difference is .3. The other .7 of value that has been created is in getting the other team to give up possession of the ball and create a loose ball. This credit should go to the defense, not the guy who gets the rebound. I doubt Jason is misunderstanding your point or just being obtuse. It is possible that you are incorrect. As Jason notes, the ball does not just magically go to the team. Someone has to make the effort to get the ball and it makes sense to give the person who gets the ball credit for that effort. By the way, if you are such an advocate of adjusted plus-minus, why do you care about this debate? Why bother trying to improve a method that interprets the stats when you advocate a method that ignores all stats? Seems like a waste of your time. Well thank you for deciding to bring in insults, Jim. Accusing somoene might intentionally being obtuse has that nice effect of making your point oh so much better. You appear to be crediting the rebound to a new possession by the team that got it rather than look at what the rebound incontrovertably means. It means that the other team didn’t score. That is not a probabilitic argument like your 0.7 points for a rebound because of the projected potential of the possession, but an actual no points, much like the actual point you said counts as a point. But this further misses the point, pardon the pun. Win score is not a measure of actual score. It’s an efficiency estimate as it relates to the probability of victory based on accumulated stats. Win score is David’s ‘dumbed down’ version of Wins produced, easier to calculate than WP, but based on what I can tell the two results correlate highly. The wins produced found that in terms of the probability of a win via a regression, a rebound raised the probability of a win some degree. Your arguments about what *might* have happened otherwise are rather irrelevent to this. That’s what they found. It’s not a product of some rationalization, but a product of empirical data. If I recall correctly, they found that a rebound raised the probability of a win about as much as a point scored. I could recall that incorrectly, and I’d really like to see the original math, but that’s much my understanding. Again, the way they derived this relationship has absolutely nothing to do with opportunity or costs of opportunity. That appears to be a part of the equation that you are forcing into an analysis that didn’t have that. (David, please feel free to correct me if I am wrong on any of this.) They concluded that a point raised it by a factor essentially equal to a rebound. That was what their analysis revealed and while this may or may not make rational sense, the rational sense isn’t what produced this relationship. If indeed a point scored raises the probability of a win to an equal degree as a rebound, whether they are awarded a score of 0.034 or or 1 or 123,364, then they are equal and thus should be in Win score and Wins produced if the two measures are trying to be consistent with each other in terms of how they value stats. If you are trying to break down win score on a logical basis surounding each possession and awarding score by that basis, you are engaging in a partial new analysis, expunging parts, but not the whole method. That’s pretty lousy science. While there may be ways to create a system based entirely on such a logical argument, that’s not how it was created and consequently adjusting it accordingly is not reasonable. However, if you insist on trying to interject a different analysis, I see no reason why you are overly insistent that the proper way to see a rebound is as a ‘loose ball’ that has some fixed probability surrounding it that sends the ball one way or another in a vacuum rather than more concretely as what it actually is: a defensive stop. It means that the *actual* points scored by the opposition on the previous possession is zero. If we could have expected them to score 1, this means that the defensive rebound was worth that many points *away* from the opposition. In this case, a rebound *is* a point, not 0.7 points or 0.3 points, but a point subtracted from what the other team should have had on that possession. Again, this isn’t how they devised their values, but so long as you insist that your view is the only correct one, you should be less myopic in your assessment of when the value of said rebound is applied. Possessions being (largely) equal in a game, it doesn’t seem appropriate to view a defensive rebound or a steal as something that gets a possession and thus gets applied to your team’s offense. There’s a key word in that stat. “Defensive.” The possessions happen all by themselves. If you play no defense at all you’ll still get the possession, not 70% of the time or 30% of the time, but 100% of the time. If you don’t ever get a defensive rebound or a steal and your opponent doesn’t commit a turnover, you’ll *still* get the ball back after they score. The value of a d-rebound isn’t that it gets you a possession–you’d get eventually in any event–but rather that you get it *without* sacrificing points to the opponent in order to do so. In terms of expected vs. actual values, if a possession on average is worth 1 point, a defensive rebound *should* be worth a point because the expected outcome of the opponent’s possession should have been a point but was actually zero. Actual minus expected is thus -1 for the opposition which can otherwise be credited as +1 in terms of relative score for the team getting the rebound. Perhaps it’s not natural to think about it in those terms because the tendency is to try to see what something does in terms of how it can produce points for your team. Despite the fact that the stat is called a *defensive* rebound, what I’m seeing here are attempts to apply its credit to an ensuing offensive possession (one that would have eventually happened in any event) while completely ignoring what it meant to the opponent’s possession when it actually happened. This isn’t surprising if we’re predisposed to thinking about scoring more being better and are always provided with concrete measures of what someone scored. I know my gut reaction to seeing a guy who rarely scores but grabs lots of rebounds as being more highly valued than a 26ppg scorer is one of intial incredulity just because it doesn’t seem right, but the argument from personal incredulity isn’t all that persuasive when hard data say otherwise. And if we focus entirely on what it means for a team’s ability to score–entirely on the offensive game as the gut reaction for many is– we can rationalize away part of the value of a defensive board when the focus should have been on what it means on defense. League wide, last season, the total Win Score was 99625. Rebounds contributed 100753 points to that score. Scoring (FGs + FTs) contributed 11978 points. “Offense” (FGs + FTs + AS + TOs) , 3457 points. And “Defense ” (STs + BKs) , 23408, but that would turn into negative if fouls (27993) were considered in this defense department. Compared to that, rebounding contributed to 38% of the season total NBA Efficiency, “offense” to 51% and “defense” to 11%. Given those numbers, it’s hard to argue that Win Score does not overvalue rebounding. It’s not surprising either that a change in the rebounding weight (from 1.0 to 0.7) has little effect on the results. Of course, that doesn’t mean NBA Efficiency is any better. Those are bizarre stats! That´s because defensive rebounds have no penalizations stats like offense (TO, failed shots) and defense (fouls), They are allways a positive thing, but when an opponent grabs an offensive rebounds, defensive rebounders must be penalized for that unefficiency. They obtain all the possession credit for catching a lost ball sometimes without any participation in getting the opponent loose the ball. It´s inside rebounds where the “not boxscored lost defense” is, but that´s never be fixed, because you´d need to analyze every play by play videos. That´s a “synergical” hard work that need to be $$ worth, but that´s the next ratings generation. What Jason does not understand is the difference between the value of a rebound to the team, which he is right about, and the value of one player getting a rebound, as that deprives other players of the opportunity to get it. I think Jason is correct. What you do not understand is the difference between how productive a player is, and why that player is productive. If it is the case that a player simply takes his rebounds from his teammates, then rebound numbers should depend upon who a player has for teammates. And we should then observe, because teammates change fairly often, wild swings in performance. But, as I noted in yesterday’s post on consistency, we don’t see wild swings in performance. Jason did an excellent job of explaining the value of a rebound. Couldn’t have said it better myself. I would add that the purpose of Wins Produced is to simply determine the value of a player’s stats. People have argued that those stats do not reflect value, but frankly, I just don’t see this in the data. I do think the interaction argument has been very much over-stated. By the way, I still need to write my discussion of PERs. Hopefully by the end of the week this will be up. I only do one post a day, and the next few days I have already scheduled items to write about. A lot of fouls and some turnovers are commited trying to rebound, then you must do the split and rest from them, not from scoring, and disruptive defense. However, those stats reflect the rating´s deformation produced by boxscore “incomplete basketball” stats. I’m well aware of the difference between the value of a rebound to a team vs the value to a particular player and have made that distinction explicit in this thread. I’m not as convinced as Dave that there may be cases where one player’s lofty rebound totals aren’t as a result of pulling them away from teammates. I don’t have anything more than anecdotal evidence of this, cases where putting a high rebound player in seems to decrease the team’s overall rebound rate (yes, Troy Murphy, I’m looking in your directions). I’m certain that it *can* happen, though Dave has looked at data more than I have and seems to suggest that these cases aren’t the rule by any stretch.